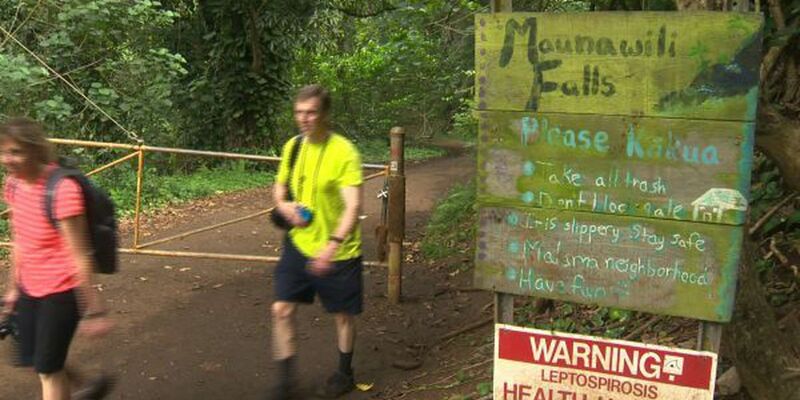 HONOLULU (HawaiiNewsNow) - The city is threatening to close Royal Hawaiian Golf Club if it doesn't address community concerns about the impact crowds of visitors to Maunawili Falls Trail are having on the community. And the trail could temporarily close while Royal Hawaiian tackles the issue. The 420-acre golf club is operating under a conditional use permit issued in 1986, and is required to provide public access to the trail. In a news release, the city Department of Planning and Permitting said it is demanding that landowner HRT Realty "address the problem immediately." In addition, the city is giving HRT Realty the option to temporarily close the trail "while it works with major stakeholders on a plan that still allows public access, but also addresses the concerns of Maunawili Estate residents." The city has given HRT Realty until June 1 to come up with a plan to re-open the trailhead and manage access going forward, and until Oct. 1 to implement it. If the changes aren't made, the city said, the permit could be terminated or operations at the golf course halted. "We expect HRT Realty to come to the table and help the Maunawili Estates community fix the problems associated with the trail," said DPP Acting Director Art Challacombe. "We don't want to temporarily close the trail, but we have to address the concerns of the residents who are forced to put up with disruptive activity in their neighborhoods on a daily basis. We look forward to an improved access opening in 2017."